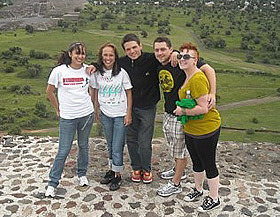 Augsburg students (starting second to left) Kaity Berg, Grady Christopherson, Kyle Soderberg and Hannah Carlson atop the Pyramid of the Sun at Teotihuacan. The first International Business semester study abroad program of the Center for Global Education (CGE) is well underway in Cuernavaca, Mexico. The five Augsburg students in the program have been using Mexico as a case study to explore the global economy in their business course and have participated in many educational excursions to deepen their coursework learning.